USCT Program | Soldiers & Sailors Memorial Hall & Museum Trust, Inc. The mission of the Soldiers & Sailors’ 6th Regiment United States Colored Troops Drum Corps is to educate young African Americans about the pride, glory and challenges faced by USCT soldiers in the Civil War. Through public performances the community will recognize how the students have learned about the significant contributions of African Americans during the Civil War and in turn, how they themselves have received a benefit from the group’s performances. We are always looking to recruit young African American men, ages 12-17, to participate in the program. 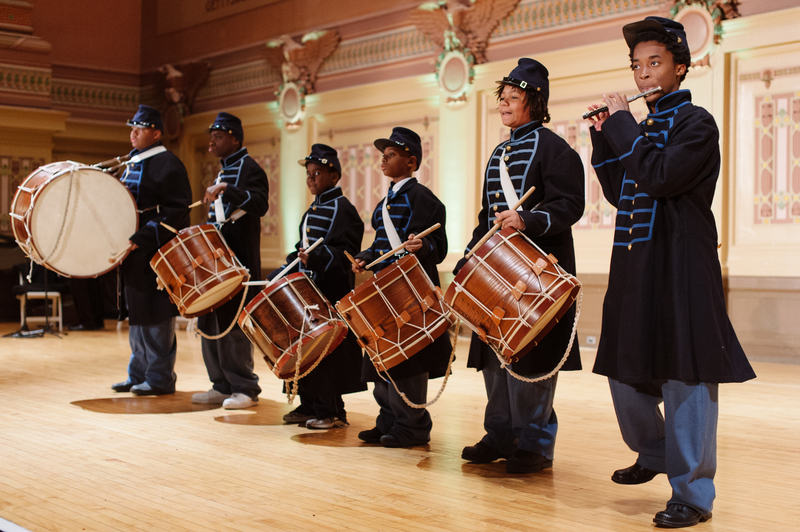 The students attend weekend meetings/practices at Soldiers & Sailors to learn about the history of the United States Colored Troops in the Civil War, receive military drill training and learn how to play Civil War era drum beats. Upon completion of the training program new members of the re-enactment corps will participate in parades and ceremonies as representatives of Soldiers & Sailors and its mission of honoring and remembering Veterans. This program is free for the participants and Soldiers & Sailors will provide reproduction Civil War uniforms, as well as, all necessary musical instruments.